Mae Sai Roong lays on the ground. She looks so little compared to the throngs of people around here — the Elephant Nature Park volunteers, the vets, the mahouts, Lek — all scrambling to make sure she doesn’t give up on life just yet. Every now and then, the old girl swings her heavy head up from the mound of dirt she’s resting it on. Swings her trunk to power her torso up, off the ground. Somehow, she manages to find the strength to do it. She looks around at all of us for a moment. Sits. Blinks. We stand, frozen. Our hearts race. We pray she can stand. Fists clench. Hopes high. Then, she gives up. Laying back down into the dirt. The sigh from the entire group is audible. It echoes in the piles of dirt around us. More scrambling ensues as people try to adjust the sand bags, the tires, the dirt, to contour to her body so she is comfortable, so her legs don’t lose circulation. So she doesn’t die in front of us. 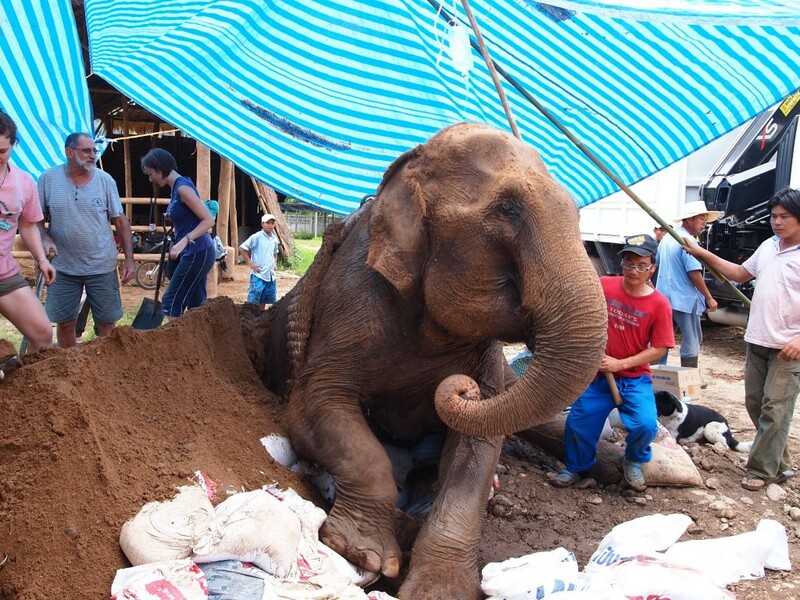 Volunteers rush to move dirt to keep the elephant comfortable. Me? I can barely watch this scene. I had heard there was a sick elephant. But, I never imagined … this. This beautiful girl, her six tons so tiny on the ground. Her body nearly lifeless except for a few short whisps of air going through her trunk when she breathes deep. After a lifetime of being in the logging and elephant trekking (giving rides to people like us) industries, they have taken their toll on this beautiful animal. My last full day at the park isn’t supposed to be like this. It isn’t supposed to be sad. It isn’t supposed to be a reminder of the repercussions of what happens to these elephants who spend their lives delighting tourists who don’t know any better. My day started out so promising. So happy. Still glowing from the afternoon before and my time with Lek’s soft singing of “Que Sera Sera” to one of the park’s baby elephants, the sun finally came out Saturday morning, casting the entire park in that warm golden hue that sends little sparks of happy to the soul. The sunny view over breakfast. Over a breakfast of pancakes, Lucy, Katy, Adele, Marie and I sit, looking out at the park and the elephants making their way out on the grounds. Even after a morning of scooping, a few of us gather on the ledge of the medical shelter, simply taking pleasure in watching as the elephants stroll along with their mahouts nearby. As the water buffalo graze. As the visitors to the park explore the grounds for the first time with pure delight at what they were seeing. I had my plan for the morning: to grab my camera, a soda, and go to the feeding platform and watch the elephants eat their buckets of fruit. It sounded like the perfect way to spend two hours before lunch. Instead, just as I am about to sit down to watch the blind elephant, Jokia, open her mouth in anticipation of food, Jack finds me. Of all of the days for the sun to be out and strong, today is the worst for it. Under the scorching sun and humid air, a group of 10 of us shovel dirt from the same mound that the elephants had rolled in two days prior when I had toured the park and gotten to be up-close with elephants. Dripping sweat, we are quickly covered in a coating of flour from the bags, along with a layer of red dirt. 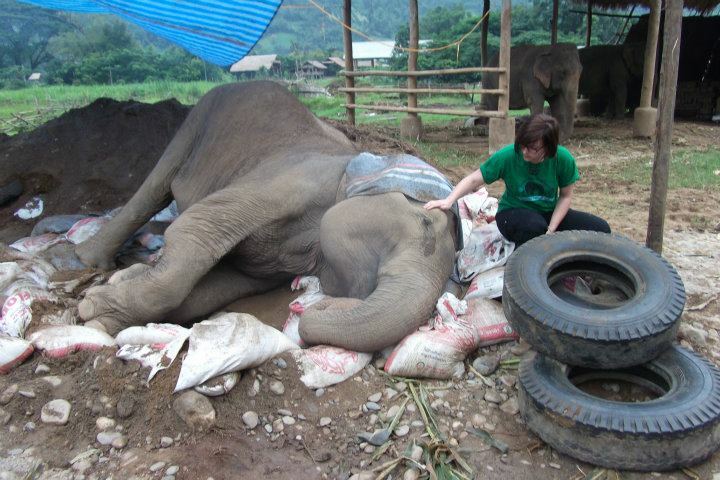 When the truck fills, some volunteers get in to go and take the bags to where the sick elephant is. Then, after a few minutes cooling off under a tree, taking a breather from the summer sun, we’re back out, filling bags again. Only, when the truck fills up this time, we are all instructed to climb in and head to the elephant’s location. I already know I don’t want to see it. When we arrive, my heart breaks. Jumping down from the back of the truck and seeing what was in front of me is something I will remember for the rest of my life. My own, personal reminder of why I will never ride an elephant or go to a circus or buy an elephant painting. So, this is what a dying elephant looks like. Mae Sai Roong doesn’t move much. She lays silently, half watching as we form an assembly line and pass out sand bags, stacking them around her legs, trying to get her to re-position herself so she doesn’t cut off circulation in her back leg she is laying on. Someone wraps a thick woven band under her belly.They are going to try to pull her up to a standing position with a crane. Lek counts off, and the truck powers on, the crane begins to lift. Slowly, the Asian elephant’s body begins to elevate, but she fights it. She begins to fall sideways, looking horribly distressed as her eyes snap wide open. She is slowly lowered back down. They wait a few minutes, and then, repeat the process. She again fights it. Her front legs coming out in front of her. I choke on a sob and pull the neck of my dirtied T-shirt over half of my face so no one can see it is now covered with streaks of tears. This time, when they begin to lower her back down, I turn around. I can’t watch this. For a moment, she looks as if she might stand on her own. As staff continue to work on the elephant and readjust dirt, tires and sand bags, Lek tells us to head back to the main building to get lunch, and then return with all of the volunteers when we are done. The few of us still there race back to the group, find everyone else, and tell them what has happened. I eat lunch quickly, filled with dread at having to return to Mae Sai Roong. I want to help. I just don’t want to see her suffering like this. We head back after lunch and are immediately put to work digging. We need to move dirt from one spot to another and form it around her body. Mae Sai Roong hasn’t changed much. She still lays there, only the efforts to get her to adjust her weight have ceased. Bananas go uneaten in the elephant’s mouth. People try in vain to get her to eat. She doesn’t. Instead, she takes the cluster of bananas wrapped in a coil of her trunk and just leaves them hanging in her mouth. A vet hooks her up to an IV. Someone else takes a mister and hovers over her body, letting the light wash of water cool her hot skin down. I spin around from where I am standing behind the elephant and see Lucy, Katy, Pam, Evelyn, Sarah, Marie and Adele, all splayed out on the mound of dirt behind Mae Sai Roong. They lay there, scooping up handfuls of earth and rubbing it on her back. All the while, they sing to her softly. I crawl up on the mound with them and take my hand in the dirt, rubbing it into her tough skin, scratching. I try to join in, but I’m overcome with sadness and instead of singing, sob. Singing to comfort Mae Sai Roong. Each song takes on meaning as we lay there, not caring about being filthy, not caring about being eaten by ants. All we care about in that moment is comforting a creature in her last moments. In letting her know she is not alone. 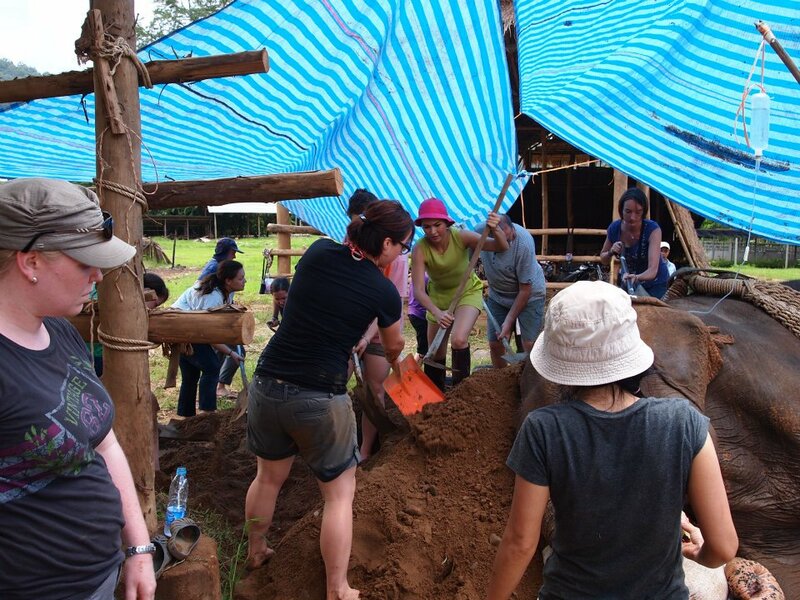 We spend nearly the entire afternoon with Mae Sai Roong, and then head to another shelter to make a bed of dirt for another elephant who needs a little help getting up from sleeping. 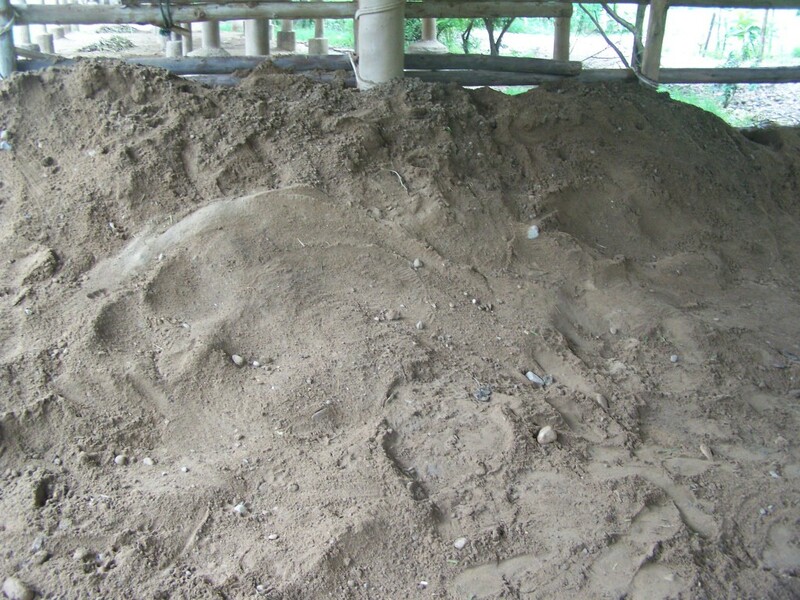 The next day, the outline is evident from the elephant who used the dirt as a bed. Even though our last night is special, and the park creates a feast of Northern Thai food for us, the mood is somber. Our group of girls go from happy to sad, smiles to tears, quickly. After dinner, Lucy, Adele, Marie and I decide we want to return to Mae Sai Roong to see her. To likely say goodbye. I know I can’t do it alone. It’s too sad. Too heart-breaking. Especially after the week I have had, the things I have learned about the plight of the Asian elephants. As we walk down the dark path towards the sick elephant, we all grab each other’s hands for comfort, and united, walk up to her. Now, a fire burns and only a few park staff are there. They will sleep with her, making sure she is comfortable the entire evening. When we get there, she looks even smaller than she did earlier. 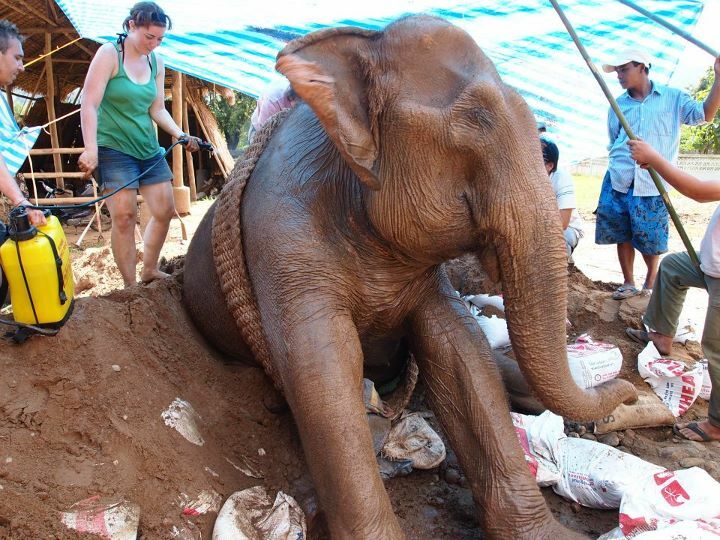 Her mahout has moved the bags of sand, helped her re-adjust. Around her, in the dark, I can hear elephants in a nearby shelter moving about. “Do they know she’s sick?” I ask one of the staff members. The four of us sit together on the gravel, silently. I let myself cry. 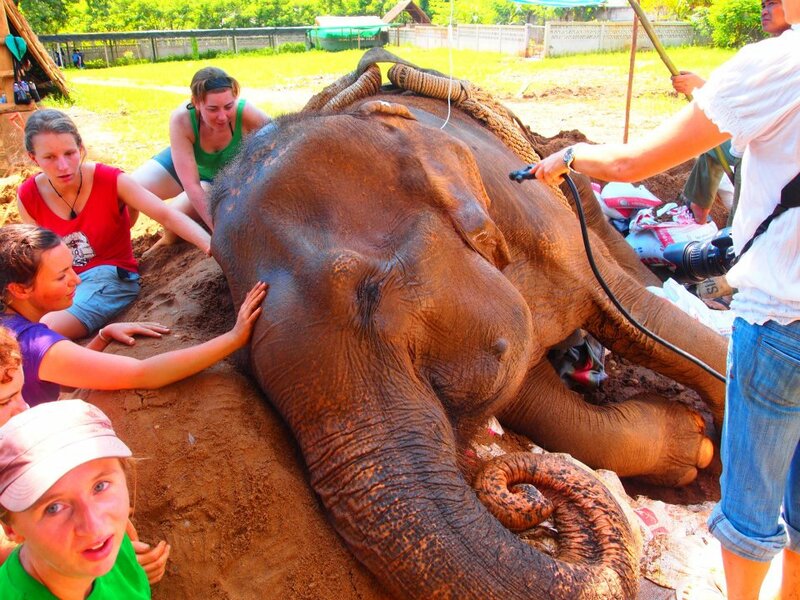 Not just for Mae Sai Roong, but for all of the elephants whose fate is the same as hers. For all of the elephants who went through the Phajaan. The abuse. The treks. We get up after a few minutes and whisper our goodbyes to the sweet girl, and then head to the river. It’s Saturday night, and loud Thai music from another camp wafts down to us. We sit in darkness, watching the strobe-light fireflies blink past us. We cry. The girls decide to return to Mae Sai Roong in the morning before breakfast, but I pass. The memory I have of her is enough for me. I fall asleep that night listening to the music. Thinking about Mae Sai Roong. In the morning, the girls visit her. A volunteer comforts Mae Sai Roong in the morning. I’m glad I didn’t go. We all sit together at breakfast, quiet. This is our experience. Together. And, as sad as it is, I cannot be more thankful I am experiencing it. I feel like this was meant to happen so I can truly understand what happens to these elephants and then come home and tell everyone. We split off into groups on our last morning with an air of sadness lingering. We’ve all been through this tragic experience together and no one wants to talk about it. “Do you see over there?” Jack asks, pointing his finger towards a blue tarp in the distance. Suddenly, the sadness is replaced with elation. She’s alive. She’s standing. We all smile, grateful to have gone through hell in order to be a part of this momentary bliss. And, deep down, I’m warmed thinking our love and support had something to do with the elephant’s little victory for the day. Very touching story. Poor elephant! Thank you for sharing your thoughts and the link, Sabine. You are right — we can make a difference everywhere. It was an absolute pleasure to do all of the other tasks associated with volunteering, the scooping, cutting, etc. It was all wonderful!! I am sure your next time at the park will be wonderful! I cannot wait to return! PS — I went to the link and left a comment and going to share with everyone. 🙂 I also added the widget to my site to hopefully capture more people’s attention. A heartbreaking story, very well told. Sad story. Anyone who has had the privilege to spend some time with an elephant in Asia — and I’m not talking about going for a ride on the back of one for an hour– will quickly understand what amazing creatures these are. It is possible to make a connection with an Asian elephant in a way that is not possible with almost any other animal except for a dog. All of these encounters left a deep and lasting impression on us. It is always said to learn about the suffering of these amazing creatures, whether that suffering is caused by man (as it often is), or by natural causes. I would love to read the piece you did for Outside Magazine. I am so glad you had the opportunity to spend time with these animals beyond the stereotypical riding, etc. I have heard about Tara and the book — it is on my list of things to read. It’s my dream to be able to work with the elephants again, more in-depth, and work to share their stories and help to influence travelers and tourists who plan on riding an elephant. The connection is powerful. Beautiful. And definitely does leave a lasting impression. Thank you for taking the time to read the story, comment and share. I was crying my eyes out reading this story! Its good to raise awareness as many people probably have no idea what goes on. I certainly didn’t. I have never rode an elephant and definitely never will. Alison, I’m sorry it made you cry!! I cried like a baby living it, writing it. I’m glad it made you feel though. And, even happier you won’t be riding an elephant!! This makes my day!!! You made me cry! It must have been difficult to write this and re-hash those sad memories. I’m sorry, Stephanie!! If it makes you feel better, I can’t read it without crying, too. It was really hard to write it and re-hash. But, I also wanted to be sure people would experience it and understand. It is important to me to speak for the elephants and educate people on this topic. Thank you for the sweet comment, Jade! The experiences while I was there were so amazing, so life-changing!! I cannot wait to go back and share even more stories! I hope these posts did what I intended — to change people’s minds about riding an elephant and going into tourist activities as responsible tourists instead of just doing what they think would be cool. Very moving story. It’s always so hard to hear about animals being abused – especially animals as majestic an elephants. Thank you for your efforts to spread the word to the world. Thank you. Your comment means a lot to me. The experience was very hard, very emotional, but it basically ignited a passion in me to go and share her story, and the other elephants, so people can learn about the tourism industry and how their actions can cause harm. Thank you for sharing your experiences with this incredible elephant. 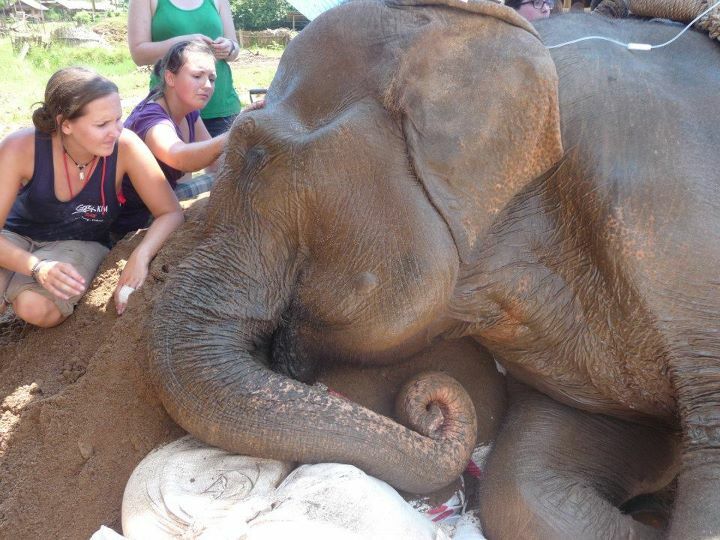 I am a regular volunteer at ENP and have had similar experiences with sick, dying elephants. There is an amazing bond we develop with these animals that cannot be denied and it is so sad to lose on that you have so quickly fallen in love with. But their legacy is the increased knowledge around the world about their painful working lives. We owe it to eles like Mae Sai Roong to continue telling her story and the stories of others like her. Thanks again. Oh D… wow. I am so bad when it comes to grief with animals. I couldn’t imagine the energy of the place during that struggle. Thank you for sharing. I cried the whole way through. I adore elephants. They are truly incredible creatures – so smart, loving & social. I can’t imagine how hard it must’ve been for you to watch her struggle. But it really is an act of compassion that you could deal with your own sorrow to help comfort her. She was blessed and lucky to have been surrounded by such caring people. I am going to have to learn more about this place – I have wanted to volunteer at a elephant refuge for my entire life and maybe this would be a great spot. WOW! that would have been so hard, I cried reading this. As having had the pleasure of spending a week at the Elephant Nature Park and feeling how magical it is, you know what these beautiful creatures have been through. Your story was lovely to read and it was so good sharing it so others get to know the plight of the elephant. Thank you, Lesley. When I was going through it, at first I was absolutely devastated that it was happening while I was a volunteer. But, then, I realized it was a story that could be incredibly powerful. And, as hard as it was to experience, I had a responsibility to share it with readers. That week was truly magical – both the good and bad. You are bringing tears to my eyes at work! Oh, Cole! I’m sorry!!! Although, I am glad reading it stirs something. I hope it has the same effect on everyone and motivates people to be a part of the change towards elephant tourism in Thailand the rest of the world! Thank you for this wonderful story. 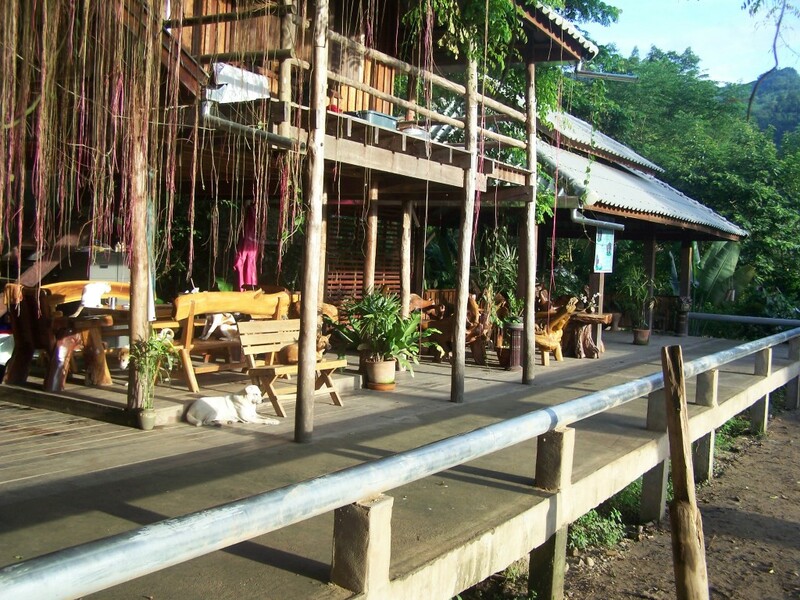 I have also volunteered at ENP and plan to go back soon. They touch your soul. I believe we all need to educate people and promote places like Lek has created. The elephants truly do touch your soul! I can’t imagine what my life would be like if I had not gone to the park. It changed me. 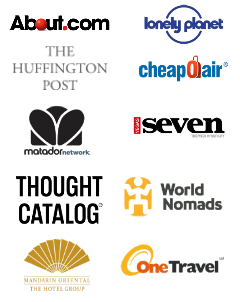 It is my goal to educate people and promote ENP, Lek and other places that do such good work like them! It is. I’m normally the one who hightails it out when it comes to seeing animals suffer. I can’t even watch that one commercial on US television about adopting animals or giving money to the foundation, it breaks my heart. But, for this, I felt I HAD to be there to understand. To share. It tore me up, but in the end, I am so grateful I was able to experience it. What a touching story! In general, I don’t think many realize exactly what is going on with the elephants. You’ve really shed a lot of light on this subject. Thank you, Samuel! I wrote this series with the goal of educating people about the asian elephant. Hopefully I was able to change minds about riding elephants and more!! I’ve been in Chiang Mai for over a month now, and I still haven’t seen *any* elephants (or tigers, or monkeys, or “long necks”), mostly because I’m worried about supporting unethical tourism. A few people have pointed me in the direction of the Elephant Nature Park, but after seeing Mae Sai Roong’s skinny little leg, I think I’ll still be holding off for a while. Oh, this made me cry. Very emotional story. So glad you are writing about Elephant Nature Park, helping to educate people. Education is the key to learning how we can make a positive impact. Have you heard of, or visited, The Elephant Sanctuary in Hohenwald, Tennessee? It is the largest natural habitat in the US specifically developed for endangered African and Asian elephants. There is a touching story about a 10-year relationship between one particular elephant, Tara, and a dog Bella. When Bella died, Tara grieved. The story is related on the web site. Thank you, Nina. I have heard of the sanctuary in Tennessee. The story of Tara and Bella was so touching and sad, but also really heart-warming that an elephant and a dog could have such a beautiful relationship! I hope others are able to learn from my time at ENP and take away a new found respect and knowledge for these creatures. Hi Diana – I need to speak with you regarding this program. Please will you email me so we can chat? Heartbreaking. I’m glad that there are places like this that comfort animals so at least they can have some joy and companionship in their lives. Thank you for sharing all your stories of your time there – it’s been enlightening and (despite the tears after this post) uplifting. Thank you, Emily. I really want people to come away with an understanding of these animals and why they should not support outfits that offer trekking, circuses and painting. Sadly, so many people book trips without doing any research or learning about the implications of their actions or the impact their decisions make on anyone but themselves. One day, I hope it will change! 🙂 Thank you for taking the time to read these stories. So heartbreaking to see an animal so magnificent yet unable to eat or stand up. You are brave, Diana. And have so much compassion. Thank you 🙂 It was heartbreaking, but the moment she stood up and I saw her from a distance … man, I was overcome with happiness. Wow. This was a really moving post. I visited the Elephant Nature Park in December – it’s a magical but also heartbreaking place. Before going, I never really knew about what was right and wrong for elephants – and I’m an animal lover and a vegetarian. There are so many options in CM and in Thailand to ride elephants and people don’t ever find out how bad it is or that feeds a culture of even worse behavior. ENF does such great work – I am so glad you wrote about it. You are right — it is magical AND heartbreaking. Like you, I never knew about what was good/bad for elephants. As soon as I found out, I made it my mission to tell everyone. The problem is, no one knows riding them is bad. They assume because an outfit says they are “eco-friendly” or even exists, that the elephants are treated well and it doesn’t harm them. Sadly, that is not the case. And, even if an outfit did treat them well, the elephants have still been disgustingly abused in order to learn how to accept riders, and the riding itself is damaging. Thank you for taking the time to read the post and comment. I appreciate the support! Wow! This must have been a really hard experience and moment to endure. Very beatifully written, you absolutley touched my heart. I’ve been extremely fond of elephants since I was child, so much so, that I love Ganesha the Indian god. Must have been absolutely inspiring to see her standing… I believe that when love is given unconditionally, good things happen. I remember when you told me about this in CM. I have since passed some of your work along to others traveling through Thailand to warn them. But not everyone listens. I send you a big hug cause I love you and another big hug for writing the story. I know it was hard for you. Thank you so much for sharing — I REALLY appreciate you taking the time to pass along the information. Sadly, not everyone listens. We learned that the night at the reggae bar. People don’t always want to know something that goes against their wants. Hopefully, one day, more people will realize it isn’t about their lists and desires, but about the animals their decisions impact. Wiping tears from my eyes as I type. This is a story that needs to be shared. I remember riding an elephant at the zoo when I was extremely young. It was an experience that I’ll never forget and had me obsessed with elephants ever since. Being older and knowing what I know now, I honestly believe that education is the best way to stop the abuse and torture on these gentle giants. It’s always so tempting for us to interact with exotic animals while on our travels and we have to make a conscious effort to realize the consequences (to the animals) of our actions. We would love to volunteer at ENP in the near future and make a positive impact on their lives. If I had one wish, other than love and happiness for the people I love, it would be for every person thinking about riding an elephant, supporting a circus, buying a painting, etc. to take the time to read this or other similar posts and LEARN about the implications of their actions. It breaks my heart that more people aren’t aware of the suffering and inadvertent permission they give an entire industry. Even Thailand’s tourism bureau has an e-book that supports elephant rides. That, to me, is appalling. But, why wouldn’t they? I mean, tourists and travelers go to Thailand and spend their money on this, why would the tourism dept. not promote such a thing? I am so glad you took the time to read this. 🙂 Thank you. Incredible writing made me tear up completely (which isn’t so good when at work!!). So sad the plight some animals are put through in the cause of entertainment for us humans. We really are a wicked species. Sweet story. But the whole thing is a bit over dramatic. There are both people and animals suffering and dying every single day and always have been. This is life. And humans have always caused suffering on animals and always will. This is human nature. To recognize it and fight it is great. To behave like a zealot and nag the crap out of a dying animal is just plain obnoxious. I’m sure the elephant mostly recovered that day because of the IV. Not because a throng of emotional people pushed her around with dirt and trucks. Arun, thank you for taking the time to write. If it seems dramatic, it is because, for me, at the time, it was. 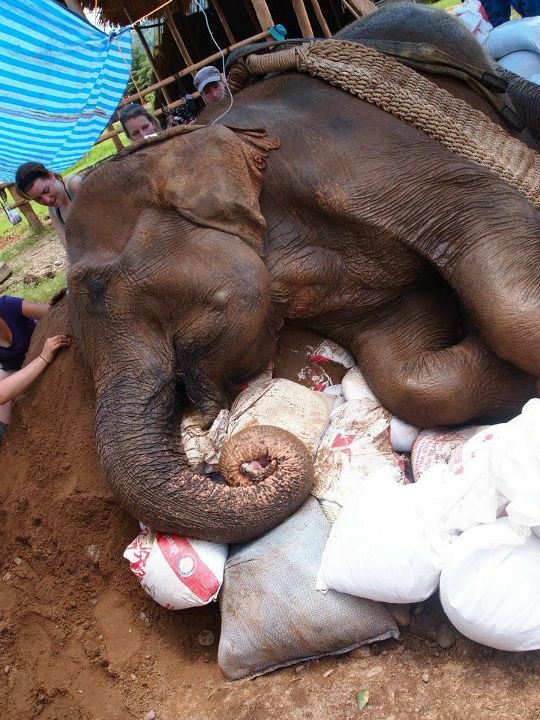 Seeing the elephant suffer was heartbreaking and awful and one of those moments I will NEVER forget. I understand this is life, and both people and animals are dying everyday. And, while I do not disagree, the elephants recovery did not come from our singing, but far more likely the IV, I don’t think it was nagging her. In the research I have read about elephants, these creatures are very social. Even when I was there, one of the baby elephants fell asleep daily with Lek singing to her. So, while I respect your opinion, I am going to politely disagree. Suzin, I have tried really hard to help spread the word. I will be at the park on Tuesday, hope to see you then! Unbelievably touching story. Thank you so much for sharing it. I hope one day people will realize that these majestic creatures deserve all the love and respect in the world. I am planning on visiting the park w 3 friends in February 2013. Was wondering if you could help me out with finding some decent lodging and directions to the park? I would love to come and lend a hand, even if just for a couple days. Thank you so much for sharing this story. It is truly a heartwrenching one. Hopefully one day people will learn to treat these animals with the love and respect they deserve! I was wondering if you could contact me at my email address, I have some inquiries about the park as I would like to visit in mid February. Thank you for sharing this wonderful post, it was very emotional. And beautiful photos! As a lover and advocate of elephants myself, I can imagine the pain you must have felt seeing the elephant suffer. I did want to say though that there is one other elephant sanctuary in Thailand (where they do let people ride elephants for a limited time) that I found to be wonderful. Have you heard of it? I spent a few days there and thought the elephants were treated well. I also keep up regularly with some of the employees and I can see how much love and dedication they give the elephants. I just wanted to share this and say that there are a few places out there where elephant rides are given and the elephants seem to be happy, well-cared for and thriving. I understand most places are not like this however. I understand what you are saying and I’m a huge elephant lover myself, believe me. I would never want to support an organization where the animals are abused. I also agree with much of what you are saying, all I wanted to share was that not all places that give rides are horrible. I know what certain elephant behavior indicates as well (swaying, etc) and none of the elephants I met were like this. I was on high alert for any signs of elephant abuse. All the elephants seemed extremely happy and their mahouts appeared to love them. Perhaps it was staged but after spending a few days there I had a good feeling about the place. Of course, I’m not an elephant nor do I speak elephant so I couldn’t ask them myself. 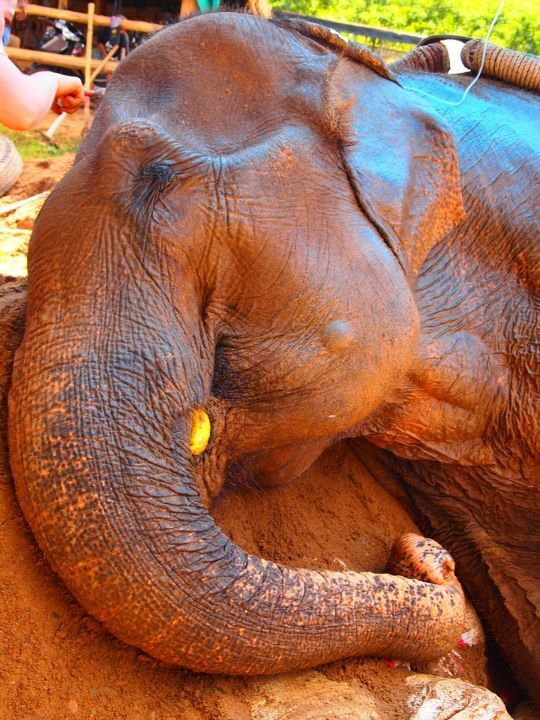 🙂 I would definitely be cautious about participating in any trekking program in Thailand but I did my research before I went and I know that this is a wonderful place where people truly do care about the elephants. Maybe it’s not 100 percent perfect but the truth is, the most perfect place for elephants would be one where they could live at peace in the wild, without any human contact or interference whatsoever. Basically, where humans would never see them or work with them. Anyway, not trying to argue, just wanted to share. Keep up the good work. You are absolutely right — not all places are horrible. 🙂 And, you are also right that the best place for them would be in the wild. I know you aren’t trying to argue … but I just want to make sure the people who visit my site and read the stories have the most accurate information without opinions on how we think they are treated. It is too easy for people to be swayed by what we report as fact without backing. Oh I’m feeling sorry for this elephant. What a touching story! Thank you. The story was quite hard to write. Very sad for the life she had previous to ENP. I am glad you realized, maybe right at the end, that she is in a better place. Death is always tragic. When it’s caused by another, even more so, if that is possible. If animals don’t go to heaven (they do! :)) then when I die, I want to go where they go. It was quite tragic. But, she is now free.